This past week has been a cold one, here in South Central Texas. We’ve also had loads of rain for the past 2 1/2 months. This now cold and rainy weather has felt more like winter, and it’s only November. This past Sunday morning, we woke to rain and a temperature of 45 degrees (that’s cold for Texans). My husband loves a hot, warming breakfast on days like these…Who doesn’t? He immediately asked me to make the Apple Pie Quinoa I adapted from Kristina LaRue’s version, over at Love and Zest. Since it’s Thanksgiving week, I was inspired, and decided to “go rogue”. I grabbed my favorite smiley emoji spatula and set out to create a pumpkin pie hot cereal that would allow us to get our refined sugar-free “pumpkin pie” on! Now, being raised a Cajun, in South Louisiana, I have years of cooking experience (been scratch cooking since I was 11) and generations of experience behind me of cooks that can make anything (even roadkill!) taste good. 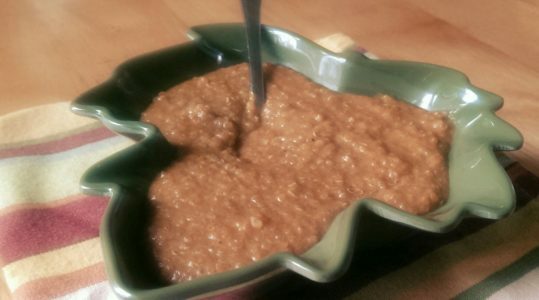 I had a clear idea of the liquid to dry ratios necessary for the desired consistency I was looking for, so I set out on Sunday morning to create a Pumpkin Pie hot cereal worthy of the occasion. When it was all said and done, my husband was satisfied and the Cajun in me couldn’t help but brand this yummy concoction with my heritage as well. I hope you enjoy my Pumpkin Pie Fauxt-meal! A delicious Fall recipe for grain-free, milk-free eaters. 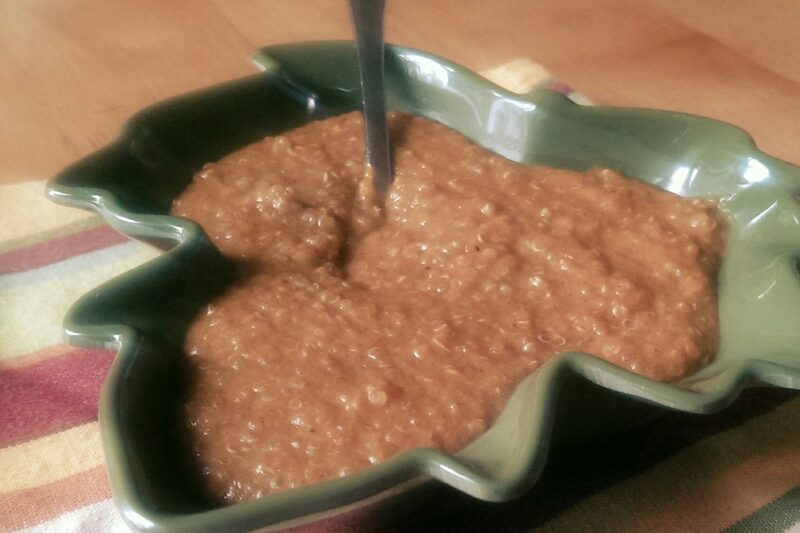 A nourishing hot cereal treat that will bring you comfort in those cold mornings ahead. 1) Add quinoa, coconut milk, water, and applesauce and salt to as medium sized sauce pan and bring to a boil. 2) Reduce to simmer and continue to cook for 20 minutes or until liquid is absorbed. 3) Stir in pumpkin puree, pumpkin pie spice, cinnamon, vanilla, and butter, collagen peptides (optional), and cook for 5 additional minutes. 4) Stir in maple syrup and stevia and serve. Adding the collagen peptides increases protein to help balance blood sugars to this dish, plus it's great for hormone health, joint health, as well as skin, hair, nails.